A new apartment building in the Highlands is moving in its first tenants.Photo by Burl Rolett. The so-called “micro apartments” have come to Denver’s Highlands neighborhood a year after a developer placed a big bet on the diminutive dwelling units. And there are more projects in the pipeline around Denver. Highland Place at 3372 W. 38th Ave. welcomed its first tenants Tuesday, about a year after Allante Properties started construction on the $18 million apartment complex. The building’s 68 apartments are mostly designed for one-person occupancy. 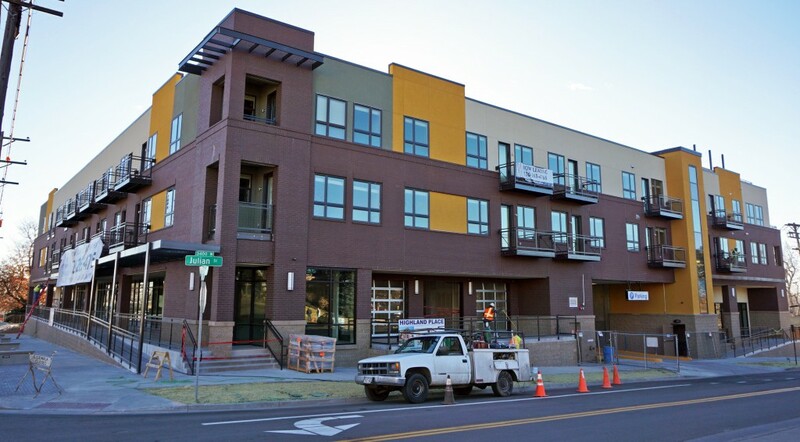 Highland Place at 38th Avenue and Julian Street got its certificate of occupancy on Monday. About 12 percent of the apartments are leased as construction wraps up. Allante is also looking for restaurant, retail and office tenants to fill 11,000 square feet of ground-floor retail space. Apartments in the building range from 378-square-foot micro studios to two-bedroom units at about 950 square feet. None of the one-bedroom units top 700 square feet, and studios range up to 540 square feet. Rates are currently listed at $1,055 per month for the smallest studio and $2,240 for the biggest two-bedroom. That puts rent in the smallest studio just shy of $2.80 per square foot. Schmidt expects rental rates in the building to climb even higher over the next year. Developing the sub-400-square-foot apartments is a risk Schmidt said he would not have taken a few years ago. But as rents climb around Denver, he said, tenants are willing to downsize to stick around the city’s more popular neighborhoods. Kephart Associates designed Highland Place, and GH Phipps Construction is the general contractor on the project. Mutual of Omaha bank financed the construction. Allante isn’t the only developer in Denver packing apartments into smaller spaces. Nichols Partnership is working on an apartment conversion project at the former Hotel VQ next to Mile High that will feature apartments as small as 330 square feet. Denver-based property manager Boutique Apartments will handle leasing for the Hotel VQ property. Boutique Apartments COO Nick Costanzo said the demand for new studio apartments is far outpacing Denver’s current studio stock. Renters are also looking for a place of their own as opposed to a two-bedroom to split with a roommate, Costanzo said. In a booming rental market, however, a one-bedroom in an in-demand neighborhood is simply out of reach for many potential tenants.